It was dark by the time the ferry docked at Takamatsu. We had identified a sports centre campground about 10K out of town, so after a supermarket sushi stop we rode south and uphill towards it. Arriving at the sports complex was just that. There were lots of little roads, unhelpful staircases and we couldn’t see the symbols for camping anywhere. Jo went into a building that looked a bit like a conference centre to ask. Weirdly, she could get into the building but not out. I had to get the automatic doors to open from outside. With directions from the staff, we found the camping area – closed due to wild boars. Lots of warning signs. Hmmm. As it was now 9pm we didn’t fancy riding much further, so went back to the facility to ask for more help. Turns out it was an old people’s home. Jo got stuck inside again, this time with no helpful information. We found a bit of grass next to an astroturf pitch and hoped the wild boar didn’t fancy a midnight kick about. 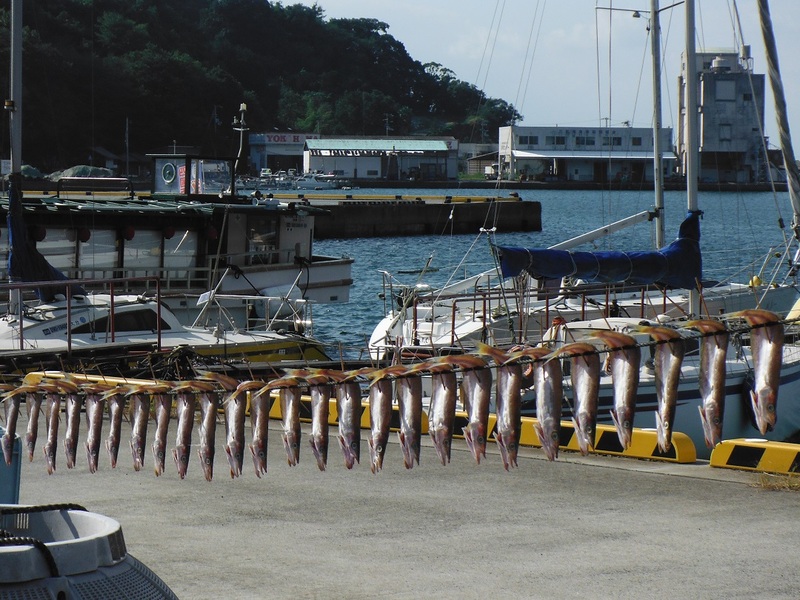 This started a Shikoku trend of campsites that were either brilliant or bizarre. 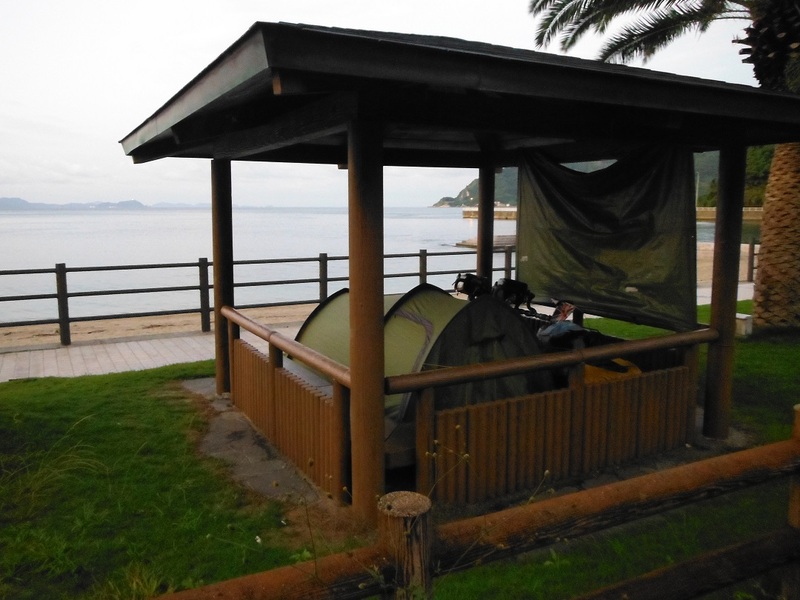 Top ones included a beach side spot under a handy shelter, and on the scenic Shimanto riverside. The real low was on some deeply furrowed ground at the side of a forestry building in a small village. Very bumpy. It was great cycling south along route 32, finally we had found a road that was flat-ish and not super busy. It was along a scenic river gorge, had some fun tunnels and some great fake construction men. We also had our second Japanese Police encounter. A kind man stopped, showed us his badge, gave us a whopping bag of mandarins, told us to call the police if we had any problems (possibly, it was in Japanese but I got the numbers) and drove off. We had just bought a bag of mandarins so the food pannier became a little unwieldy. They had just come into season and had become Japan’s only affordable produce item. There are some seriously pricey nashi pears around should you be considering a fruit based investment any time soon. 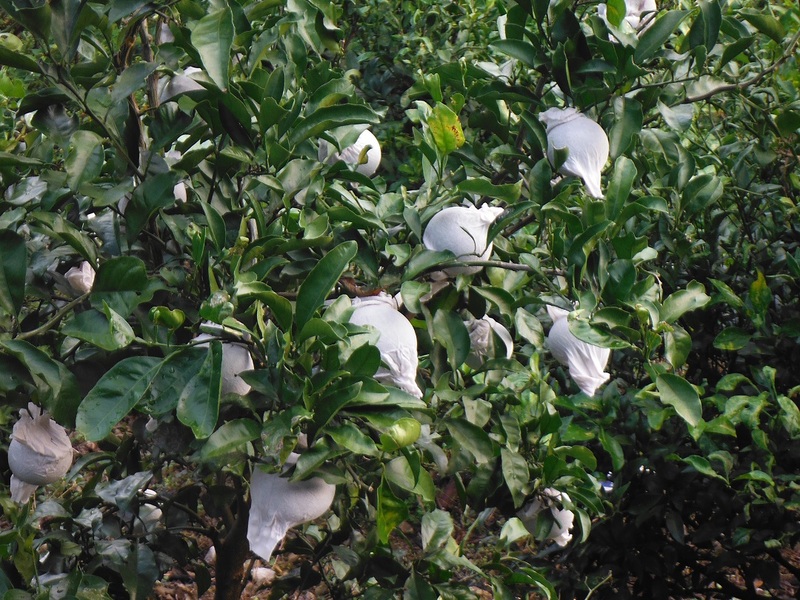 Even better, next time you are mentally planning what to do with your lottery winnings, buy an orchard in Japan. The cycling went figuratively downhill but actually uphill when we turned off to visit a bridge made from vines in a neighbouring valley. We saw a little road barrier up above us, virtually in cloud, and thought, ‘wow, you couldn’t get up there in 6km, that can’t be our road.’ Apparently you could, and it was. We cursed our choice, especially knowing that we would have to do the climb in reverse the next day. Even better, the next day it rained like the sky was falling in. 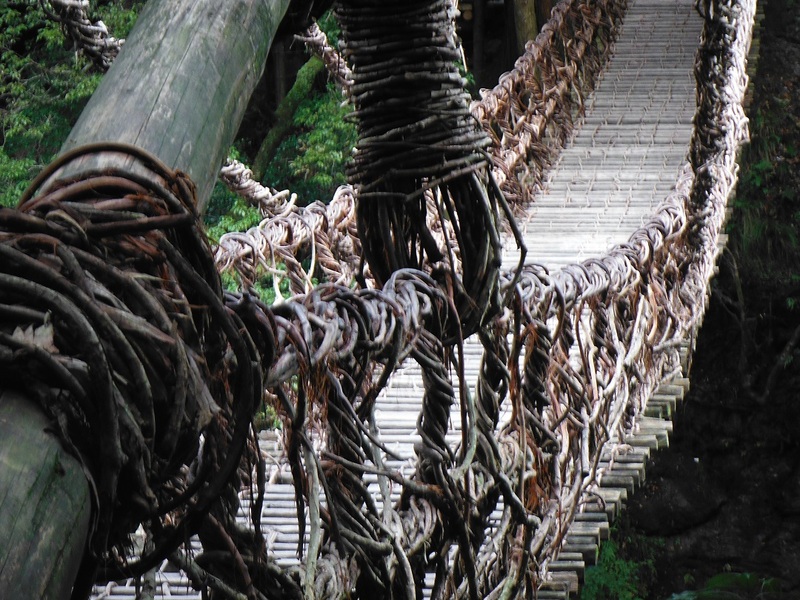 Luckily the vine bridge was very cool indeed. It was great to see the sea and the sunshine after we left Kochi on the Saturday morning. The road followed the south coast for a good stretch and we passed lots of pilgrims in hats and white shirts walking the 88 temples route. We turned further inland on route 81, followed the Shimanto river and supplemented our mandarin intake with local kaki. 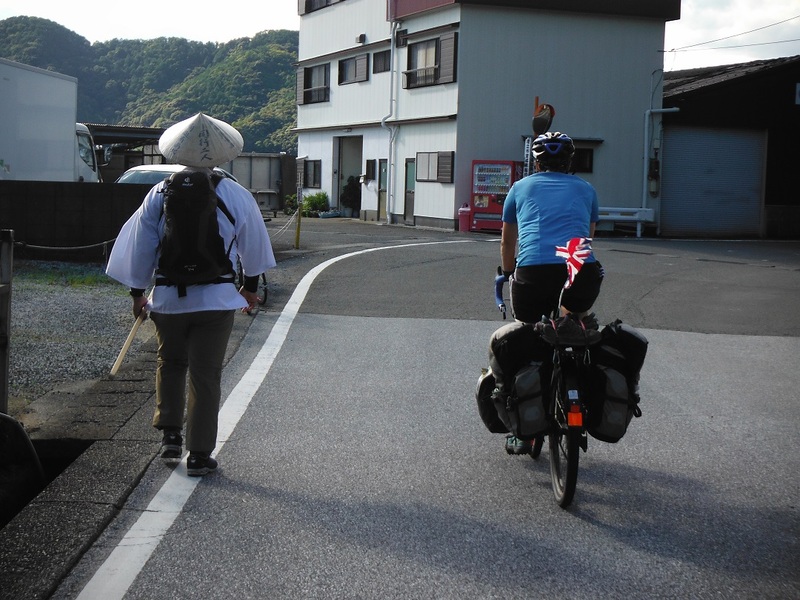 Shikoku was definitely the best cycling of our time in Japan, even before we found out about hat cakes. The road along the west coast was right along the sea, great views, occasional beaches and even more mandarins and kakis. This time free from some kind ladies in a bakery that filled our water bottles too. We also had another fun ‘onsen before bed’ camping night. Though I think some of the onsen-induced relaxation may have been lost as we had to put up the tent in rain and high winds in the dark after our soothing soak. Jo was particularly proud of her tarp-windbreak construction. Great breakfast spot after an uncomfortable sleep on bumps. Lots of little harbours and fishing villages. Arriving by ferry to Kyushu, we decided to have a rest afternoon and more onsen time in Beppu. It’s possible we didn’t see it’s best areas, as Beppu appeared to be a bit like a Japanese Skegness with more sleaze and hot springs, and less stag dos and candyfloss. It was the ugliest town we had seen (there had been a few unpretty ones) and the only town we visited in Japan where it seemed like there might be somewhere you shouldn’t walk at night. The old onsen building made up for it – a historic wooden and stone building with very hot baths for one US dollar. Brilliant. Beppu really made itself unforgettable when our sushi arrived on a mini bullet train later that evening. I cannot imagine why this travel experience is not listed in any information I have read about Japan. Running out of time, we took the most direct route to Fukuoka and it wasn’t super fun. 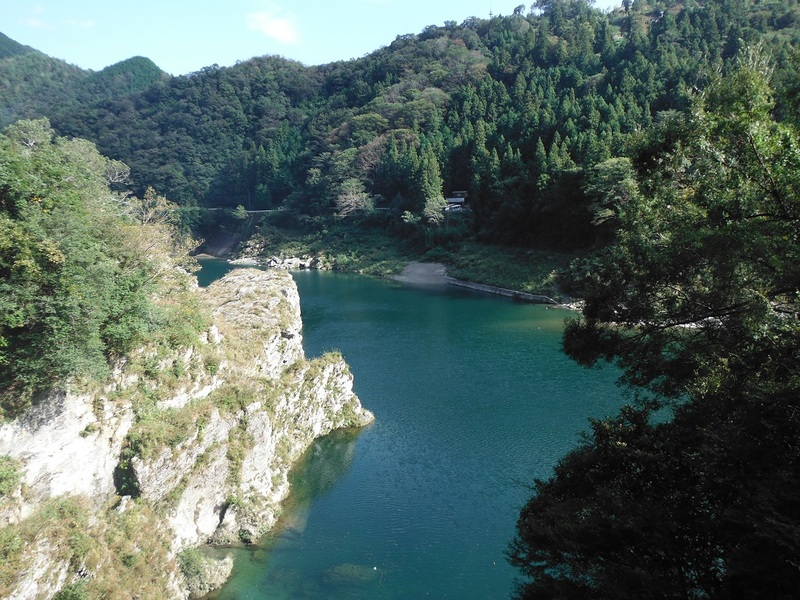 If you find yourself cycling in Kyushu, leave more time and go a different way to us. The highlight of the trip was finding egg and rice vending machines with a pleasant rest area at the roadside. 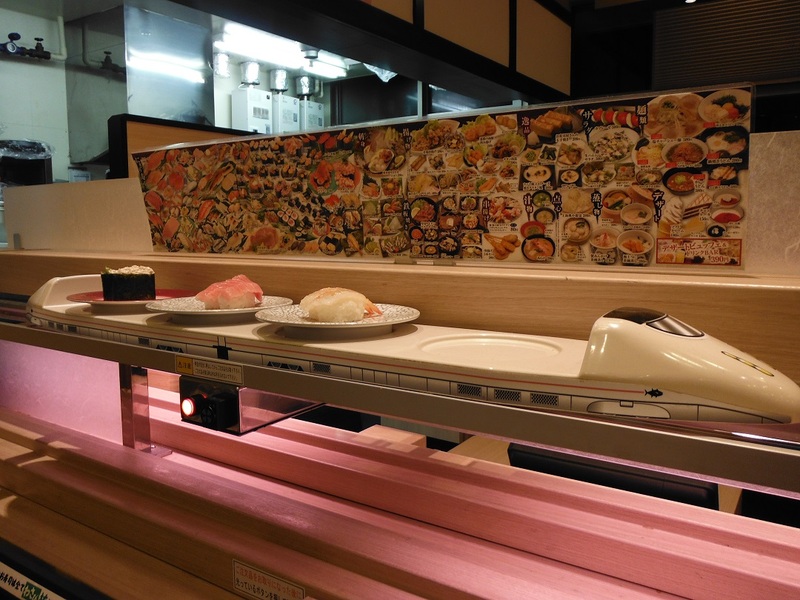 As I’ve since learned there’s an egg vending machine in Sileby, Leicestershire, probably go for the mini-train Sushi when you are planning your own trip. 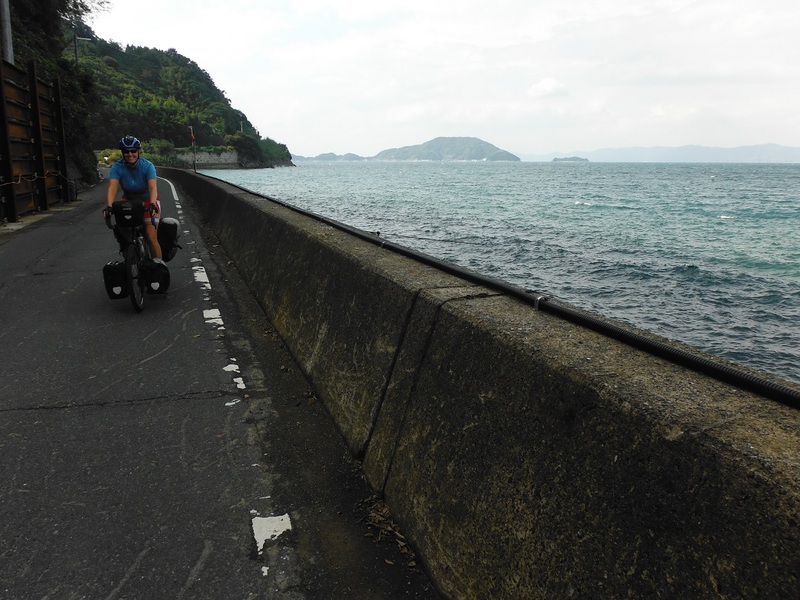 When we spoke to locals in the Tokyo and Fuji area at the start of our Japan cycle, their reaction to us cycling to Fukuoka was usually ‘This is not possible,’ accompanied by headshakes, crazy foreigner expressions etc. They were nearly proved right, when on the last day we saw some mile markers counting down to something. It turned out they were counting down to the point the road became a motorway and bikes were not allowed. Cue steep and long detour on much smaller road. As I said, go a different way to us. Japan is a fantastic country to visit. 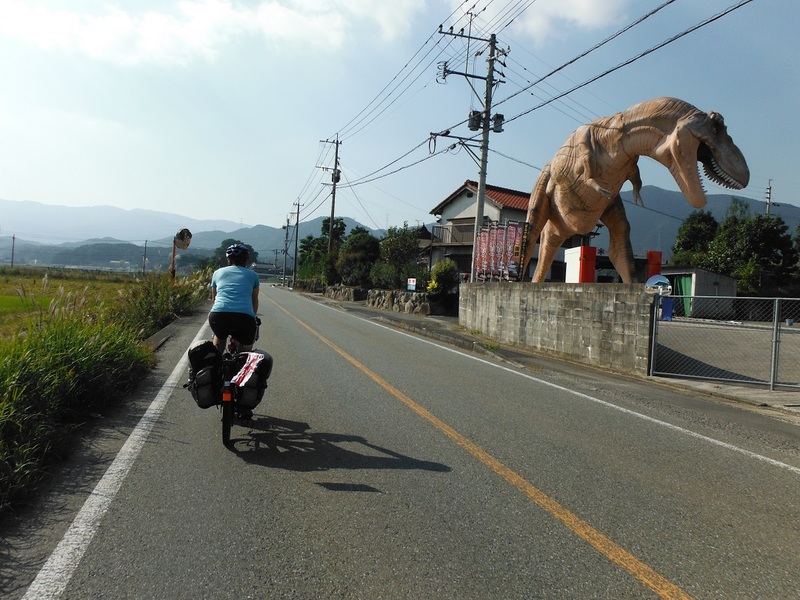 Cycling on Honshu and along our Kyushu route is not for the faint hearted as the more built up areas can be very busy. Having said that, car drivers were almost always patient and considerate when passing us. 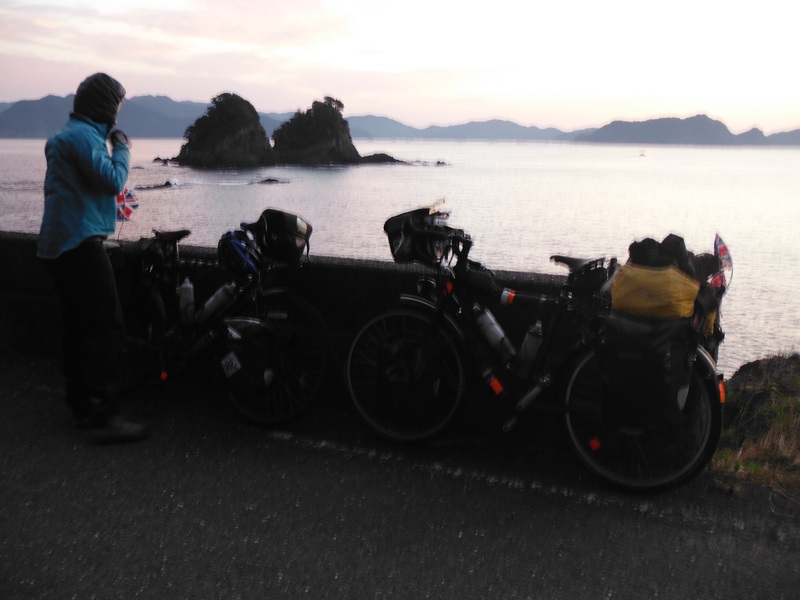 Shikoku was by far the most enjoyable cycling of our trip. 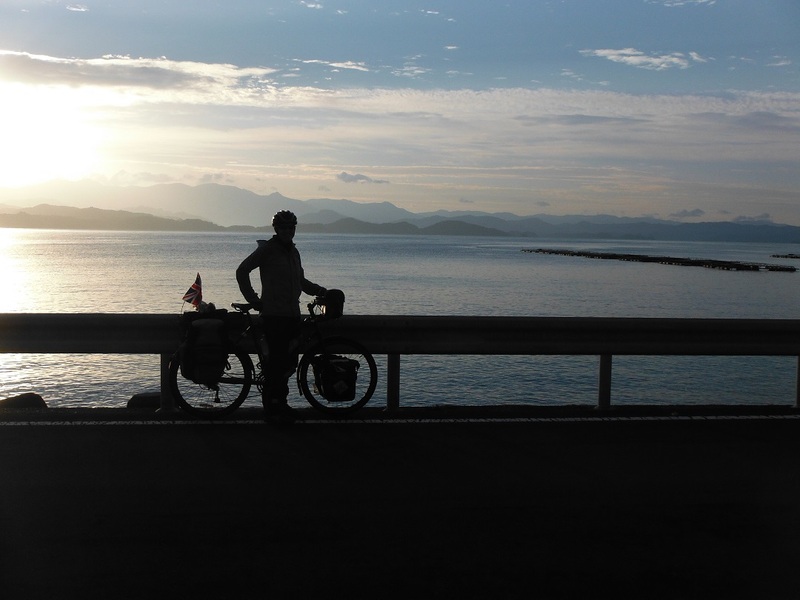 Navigating Japan wasn’t too tricky – we didn’t buy the maps that most cycling websites recommend and just used our offline map to find ourselves in cities sometimes. There were times when we had to look for the Kanji for a town name as English wasn’t on the signs, this was more tricky. The only symbols I would be confident to recognise only a few weeks later are the five that make up ‘campground’ and the one for ‘western’ toilet (as opposed to squat). I wish we had learned more Japanese to speak to people though we always managed to achieve what we needed with some prepared phrases, gesturing etc. People were friendly and kind, even when they clearly thought we were deranged for cycling so far with loads of stuff. Just like people we have met in Italy, Croatia, USA and everywhere else. Japan wasn’t part of the original trip plan, but I’m really pleased we took the opportunity to visit this truly unique place. Great scenery, awesome food, and a good sprinkling of crazy stuff. A fair sprinkling of crazy stuff. More than one gas station had their own T Rex.